My name is Duane Boone and I am a 49 year old, first year member of CAPS. I was born and lived in Saint John , NB until age 40, when I relocated to Fort McMurray, AB. About two years ago my wife and I made yet another move to Red Deer, AB where we have happily resided since. Over the past thirty years I have worked primarily in the petrochemical industry, with a five year detour in the IT programming and e-learning fields. 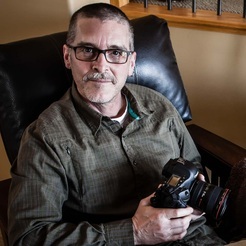 I currently live with my wonderful (and photography supporting) wife Tina who hails from California, and have three adult children all in university; Brittaney in Saint John, NB, and Justin and Nicholas both in the San Francisco bay area. Last but not least, we have our three adopted children, Brandy the Australian Cattle Dog, and our two new cats, Sequoia and Jasper. Tina and I like to spend our time exploring the many rural roads in central Alberta, camera in hand, and travelling to spend time with family when possible. I hope to do something memorable to mark my 50th birthday this year, be it visit and photograph the parks in Utah and Arizona or do a NASCAR ride-along. And no, it won’t be skydiving! I have come to love photography and the challenges it provides. The blend of art and technology is a perfect balance that continues to keep me captivated, and has provided the perfect therapy and escape when when life get tough. I hope to continue my involvement with CAPS; the speaker series has been terrific and the competitions have kept me actively shooting and striving to be more creative. We asked Duane the following questions and these are his answers. A: I love to shoot anything to do with nature. That isn’t my only subject matter but it’s the one that challenges me the most; identifying locations, determining when to be there, and trying to capture it in a new way. I love the weather and the impact it can have on a scene, which is why I enjoy shooting during storms or at night, just to change things up. Also, I am fortunate in that I am from New Brunswick, the “Picture Province”, live in Alberta with all it’s diversity, and have a wife from California. These three locations I believe are among some of the finest in all of North America for photography and they offer limitless photo opportunities when we travel to visit family. This allows me to share my travels and experiences with family and friends, and let them see for themselves what we have around us to enjoy. Q: What kind of equipment do use now, and what did you start with? A: When my wife and I relocated to Fort McMurray in 2005 we quickly tired of the pace of the town. As soon as we got to our days off we headed out of the city, exploring dirt roads and nearby sights. The more we did so, the more I wanted to capture some of these things, so I bought an inexpensive Canon point and shoot. It wasn’t long before my desire to make unique photos surpassed the capabilities of that camera, so I moved to a Canon DSLR system. I’m embarrassed to say I got acquisition fever and ended up with both a 1D Mk III and a 5D Mk II plus many lenses, filters, studio strobes; you name it. After a trip to Death Valley last year I finally reached the point where dragging along a large Pelican case, camera bag, tripod, etc. became just too much. I had been reading a lot about the new mirrorless systems and made the plunge. I traded in all of my Canon gear at our local camera store, McBains, and purchased a complete Olympus OMD-EM1 set up with 6+ lenses. All I can say is that I have had zero regrets. The great image quality, latest features, plus the reduction in size and weight have made me a 100% mirrorless advocate. A: Shoot all you can, and try a different approach or technique every time. Learn your camera inside and out; a better camera doesn’t make better photos but it’s a tool that allows you to master your craft when used properly. Get and learn Lightroom, Photoshop, and any other quality imaging software you can afford. (PS + LR for $9.99 a month US, no excuses not to have this tool) Read everything you can about photography from the technical to the creative; any information will help build your confidence and abilities when you hit the field. Wear out the internet! Whether its looking at other peoples photos, posting your own, message boards, articles, videos, there is an overwhelming amount of photography related information out there for free! Subscribe to some podcasts. There is nothing any more motivating for me than listening to people talk photography as I am driving to the mountains or the ocean for a shoot. Q: What is the best piece of gear in your camera bag? A: I am going to cheat; I have a couple. My microfibre cloth and dust blower have become my best friends; I wish I could recover all the images I ruined in the past with errant dust, finger smudges or filth induced haze! Secondly and probably most importantly, my iPhone or iPad. Being a nature/landscape guy I find the information I can access on location is invaluable. Location searches, maps and GPS, weather information, and fantastic apps like the Photographers Ephemeris for sun and moon locations, exposure calculators, and now, LR mobile and wireless connectivity to my camera for remote control. I love todays technology and the tools it provides us. A: ﻿ Oh man. Not enough hours in the day for this one. I love to travel and explore new locations. Woodworking, fishing, mountain biking, cooking. I think I need to retire soon to free up more play time. Q: Could you describe the best photograph you ever made and how you made it? A: I’m going to be a bit cheesy with this one; I haven’t made my “best” photo yet. The ones I enjoy and treasure the most are the ones I worked the hardest for. Driving for six hours to be on the floor of Death Valley at 1 am for the lunar eclipse, hiking for miles at 13,000 feet to capture the ancient bristlecone pines, standing alone at the foot of the Athabasca Glacier in the dark, in December, at midnight, in -20 temperatures, just to catch the Milky Way as it passed over the glacier. I can look at those photos and remember the moment and the reward of being there, regardless of how well the images turned out. Duane provided us with some of his photographs which he would like to share with you.